I wonder whether people who see the photo at the top of this page might feel ‘what on earth is this combination of people?!’... I’m joined for this session by Sakamoto-san and Sakaguchi-san, a pair who share a curious connection and who are also, by chance, both about to complete development of a game for Wii. Furthermore, Sakaguchi-san, Sakamoto-san and myself are actually all from the same generation, so today we’ll be able to have a bit of a chat among contemporaries. (laughs) Though I really can’t predict how this interview is going to turn out, I’d like to thank you both very much for coming. Now, it seems most people out there don’t know this, but you two came into contact with each other over twenty years ago when working on a certain game, didn’t you? I’d like to start this session right away by talking about that game, so could you explain a little bit about it, Sakamoto-san? Yeah, this is really nostalgic. Can I take one of these? It was a game where the player made phone calls while playing, wasn’t it? transferring to the school that Miho Nakayama was attending – Miho Nakayama was a big celebrity, but she was hiding her real identity... (laughs) The player then gets to know her, they become close friends and so on... That’s the kind of game we’re talking about here. In what capacity did you participate in the project back then, Sakamoto-san? First off, Square2 said ‘we want to make plans for an adventure game that uses the telephone’. 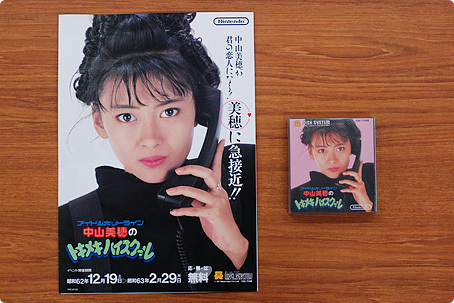 At that point, there was no mention at all that it would be a game which featured Miho Nakayama. They just wanted to use the telephone as a game mechanism. I happened to be called to that meeting, and listened to the discussion. 2 Square = currently Square Enix. 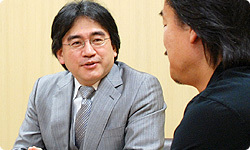 Apart from Nakayama Miho no Tokimeki High School, they have collaborated with Nintendo on the development of titles such as Super Mario RPG: Legend of the Seven Stars, which was released for the SNES in Japan in 1996 and first appeared in Europe for the Virtual Console on Wii in 2008. Roughly how many years had you been at the company by then, Sakamoto-san? Maybe... Seven years or so? 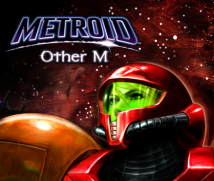 Which year was this game released again...? (looks at the leaflet) 1987. So it would have been about your fifth year at the company. My fifth year... Ah, that’s right, that’s when it was. You and I both started working in 1982, Sakamoto-san. You started in 1983, didn’t you, Sakaguchi-san? At that time, my fifth year at the company, I was starting to get interested in adventure games, so I excitedly said to my superior ‘this looks fun, I’d like to do it’. I told him, however, that if we were going to make the game, we shouldn’t create a character to use in it, but should use a celebrity instead and make the whole thing a bit of an event or a kind of festival. Were you interested in celebrities, then, Sakamoto-san? 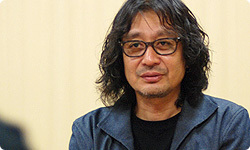 When did you first come across Sakaguchi-san? It was quite a while after development had started. Yes, that’s right. It was decided that we’d go and visit Nintendo after reaching the last stages of development... How long was I in Kyoto for that time...? You were here for quite a while, weren’t you? I must have been living out of a suitcase for about two weeks. I was staying in that hotel in front of Kyoto station at the time. Ah! I’ve stayed there many a time – that’s all a while ago now, mind you. (laughs) Every time a software title was being finished up, I would shut myself up in Kyoto. Incidentally, Sakamoto-san created the pixel art when we made Balloon Fight3. 3 Balloon Fight was an action game released in Japanese arcades in 1984, and released for the NES in 1985 in Japan. I used to come across him when doing things like picking up corrected picture data. 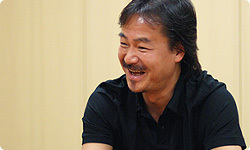 When we were progressing with the Tokimeki High School project, Sakaguchi-san was producing Final Fantasy4. 4 Final Fantasy was an RPG game released for the NES in December 1987 in Japan. It was the first game in the series. So this was around the same time as Final Fantasy? That’s right. Tokimeki High School was actually being done by another team, but since I was free at just the right time, I eventually got involved as well. No, I think his hairstyle was just the same back then, wasn’t it? ‘Why is he wearing the Nintendo uniform?’ – something like that? So Sakaguchi-san, did you finish the development of Final Fantasy and then join the Tokimeki High School project? Yes. Several people from the team joined the project, for about three months I think it was. Then at the end about 10 team members went down to Kyoto together, staying in a hotel for about two weeks, and somehow we were able to finish development. We all thought, ‘ah, that’s done’, and went for a drink together. While we were there though, someone called the bar, saying ‘the motorbike in the game’s ending is flying through the air’. When we got that message, we all thought ‘there’s no way we could have a bug which looks that good’ and ‘this must be someone’s doing...’ We went back to the office and... It really was flying. It really was a beautiful bug. (laughs) I remember that really clearly.